I found this quote today and felt it was appropriate. My health has deteriorated over the past few years and I am NOT going to let that continue. I’m not going to keep “patching leaks” and placing band-aids. Things must change. . . I posted last week about some of the immediate changes I had made to improve my health and I’ve even surprised myself. . .I’m more committed to this today than when I first started. That’s not characteristic of me. I’m a quick starter, less follow-through. You have a project for me?. . great! Let’s do that! But, a few weeks in, I’ve been distracted by the next new idea. In the past week, I’ve tried to eat fresh, organic, home-spun meals and have been quite successful. We went to dinner one night at Dodge City Distillery and I will admit to you all that I ate some deep-fried haystack onions. My BG numbers were up that night, and hovered awhile. I learned my lesson. I’ve also been to Oklahoma Joe’s, AMC Fork & Screen movie theater and Minsky’s Pizza this week. However, my choices were MUCH better than before. A green salad, a plate of hummus and veggies and Chicken Tagliata (Veggies sauteed in olive oil) were my choices and I had no issues with my BGs. YAY! I’m REALLY grateful my better food choices are leading to better diabetes control. I have surgery coming up at the end of February and the better I manage my diabetes, the better I’ll heal. So. . on to the other changes we’ve made toward becoming a greener, healthier home. I tried making my own body wash. . didn’t like that recipe, so I’ll try again. Once I perfect that, I’ll share the recipe with you all. I made my own dusting spray, which smells really great and leaves the whole room smelling clean with just a hint of lavender. I’ll post that recipe later too. I need to find the original author to properly credit them. Today, I made this AMAZING toothpaste as instructed by “Crunchy Betty.” I’ve scoured this website for all sorts of information and have really liked many of the recipes she’s come up with. Place the ingredients in a bowl and mash it all up with a fork until blended. It really does form a nice “toothpaste” consistency. Crunchy Betty states that she placed hers in a jar and dips her toothbrush in it each time. I thought, just in case DH wants to try it too, I’d try to make it as toothpaste-like as possible. I formed a cone with waxed paper, as my mama taught me for cake decorating, and pushed the toothpaste down into the tip. I rolled down the remaining waxed paper and VOILA! TOOTHPASTE! 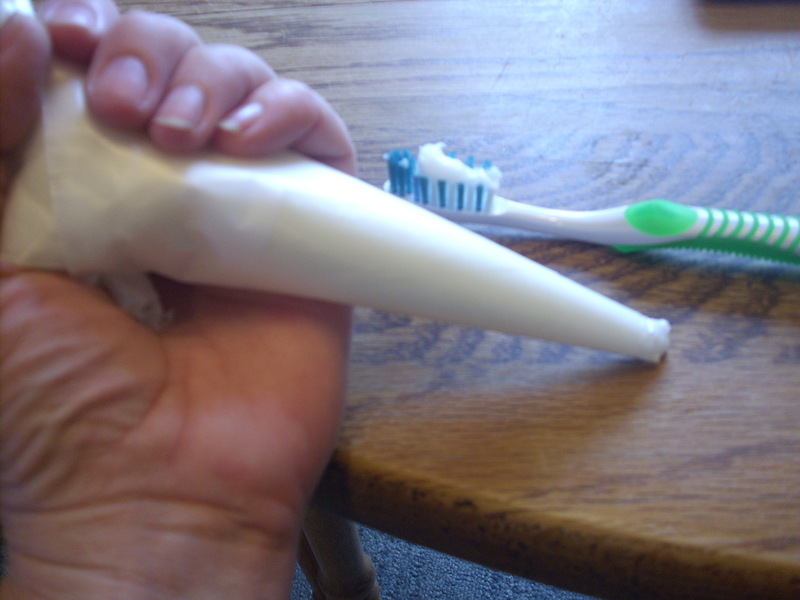 I never realized it was so hard to take a picture of your own hand, squeezing toothpaste onto a brush! This is made with baking soda, so there is a definite baking soda feel and taste, but you can also taste a hint of coconut from the carrier oil and the peppermint essential oil is just yummy. I did use it this morning, prior to buying the peppermint oil and while it worked and tasted fine, I did miss a minty feeling and taste. I’m so glad I added the peppermint, it is just the kick it needed. Why am I messing with such things? Well, for one, it will save us some money. The ingredients sound expensive at the beginning, but when you see how little you use of each of item, it will absolutely be a cost savings. More importantly. . these are all natural, organic ingredients. You know that warning on the label that says you can’t swallow the toothpaste? Supervise children while brushing and teach them to not swallow it? Yeah. . .no worries here. You can actually eat this if you were so inclined. Deliberate-This is my word for the year. I can either continue my old habits without thinking, using the same products over and over without ever reading a label. Or I can be DELIBERATE about my health. I WILL deliberately look at what I ingest, I wear, I wash with and make sure that it is healthy for me. God gave me this ONE body and after this past year of cancer, diabetes, surgeries and side effects, I plan to be a much better steward of His gift. Let me know if you try this recipe. I’d like to know your thoughts. What products have you replaced with more healthy, or organic versions?